The DAX index has steadied on the Wednesday session, after jumping 1.0% on Tuesday. Currently, the DAX is at 11,133, up 0.07% on the day. On the release front, eurozone industrial production declined 0.9%, below the estimate of -0.4%. On Thursday, the eurozone and Germany release GDP reports. 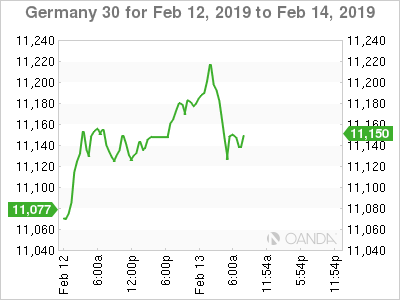 The DAX has climbed 2.2% this week, erasing almost all of the losses sustained in the first week of February. On Tuesday, European blue-chip indices posted strong gains, courtesy of unexpectedly strong earnings at Michelin, the giant French tire maker. This triggered strong gains for German and French automakers and boosted the DAX and CAC, which gained 1.0% and 0.84%, respectively. The U.S-China trade war has rocked equity markets and dampened risk appetite. The U.S. has imposed 10% tariffs on Chinese goods and has threatened to raise the tariffs to a punishing 25% on March 1. Trade officials from the U.S. and China are meeting for a third round of negotiations, and U.S. Treasury Secretary Steven Mnuchin has joined the talks. There was positive news on Tuesday, as President Trump said that he could postpone the March 1 deadline if the trade talks made sufficient progress. The global trade war has dampened the appetite for German and eurozone exports, which has weighed on the manufacturing sector. On Wednesday, eurozone industrial production in December fell 0.9%, its third decline in four months. Last week, German industrial production and factory both posted declines.